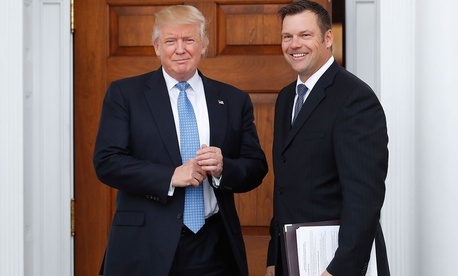 Kansas secretary of state Kris Kobach met with president-elect Donald J. Trump on Nov. 20 to discuss “border security, international terrorism, and reforming federal bureaucracy,” according to the president-elect’s transition team. The photograph, captured by the Associated Press, offers more details about Kobach’s controversial proposal for a registry for Muslims entering the US, and other drastic suggestions for US border security and immigration. Kobach was once rumored to be a potential candidate for the director of the DHS, which deals with such issues. The Trump team said last week he is not an official advisor. It is unclear whether the plan was accidentally displayed or not, but it makes clear that targeting Muslims is at the top of Kobach’s list. Here’s what the plan says. Update and reintroduce the NSFERS screening and tracking system (National Security Entry-Exit Registration System) that was in place from 2002-2005. All aliens from high-risk areas are tracked. Add extreme vetting questions for high-risk aliens: question them regarding, support for Sharia law, jihad, equality of men and women, the United States Constitution. NSFERS, a post-9/11 registration process for Arab and Muslim men, was suspended in 2011 because it amounted to racial profiling (paywall). Before the controversial tracking program ended, a mere 11 men from the 85,000 profiled were found to foster terrorism links. In addition to targeting Muslims, Kobach’s plan appears to propose analyzing “193,000 criminal removal cases dropped by the Obama Administration.” The figure appears to come from a Center for Immigration Studies report from 2014 that was widely covered by conservative media outlets, but dismissed as misleading by the American Immigration Council. And further down on the front page of the plan, below Kobach’s hand, there’s a reference to “voter rolls,” and “Draft Amendments to National Voter…” The latter is presumably the National Voter Registration Act, introduced in 1993 to make voting easier for Americans. As Kansas secretary of state, Kobach has politicized voting registration (paywall) by trying to toughen identification requirements, a move that was struck down in court in August and is widely believed to limit turnout among Democrats.